Email marketing is the best marketing method of 2017. And what you need for it is the best Email marketing software. Finding an email marketing software is easy. But finding one that meets your needs and budget isn’t. Here, I have listed few of the best and affordable email marketing software for 2017. MailChimp is one the most popular Email Marketing service. They provide a good user interface and support. There are many tools to help you in MailChimp. You can integrate it with WordPress, Shopify, Magneto, etc. For WordPress, you can use their WordPress plugin. Click here to download their plugin for your WordPress Blog now. There are autoresponders, tracking, schedule mail, etc. You can sign up for their Forever Free plan. The Forever Free plan allows you to send 12,000 emails for 2000 subscribers. And the premium plan starts at a price of $10 per month. One of the best and powerful tools for email marketing. You can integrate it with WordPress and many other platforms. The price starts at $9 per month. You can add up to 500 subscribers in that plan. There’s no free plan, but you can claim your Free Trial plan. ActiveCampaign is worth the price if you are looking for marketing automation. Also, it helps you to segment the contacts based on location, action, behavior, etc. ActiveCampaign have the best automation system. This is a popular Email Marketing Software, which is being used by many online marketers. GetResponse have amazing automation tool for online marketers. It has a user friendly interface which makes it easy to use. The price starts at $15 per month. And you can sign up for a Free 30 Days Trial here. It worth the price as it contains a lot of useful tools and the support team. You can contact them for any help related to email marketing. You can integrate it with third party software for collecting email IDs. The most popular Email marketing tool. Getting started with Aweber is easy, and it can integrate it with WordPress and many other platforms. 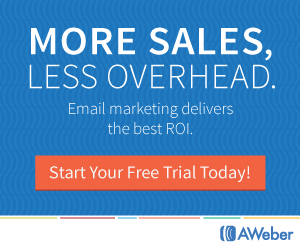 Automation and email tracking become easy with Aweber. The price starts at $19 per month. It offers 30 Days Free Trial. You can click here to claim the trial plan. You can connect with their support team for any help related to Email Marketing. They provide the best support for their customers. You can be one of those customers by claiming the Trial plan. Not the best, but great for beginners. SendInBlue provides the best Free plan. You can send up to 9000 emails per month in Free plan and add unlimited contacts. The template designer and other tools make it awesome. The price of the premium plan starts at $7.39 per month. You can sign up for the Free plan or Premium plan here. In Premium plan, automation and other tools are available.